Dissolved gas in the solvent or buffer often is problematic, since due to changes of temperature or pressure, bubbles can emerge. These bubbles can significantly influence the performance of your HPLC system and reduce the quality of your analysis.. Using a degasser dissolved gasses can be efficiently removed from liquids and subsequently, problems with bubbles can be avoided. 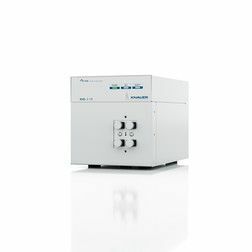 KNAUER provides degassers for analytical and semi-preparative HPLC, as well as for FPLC.